As most of you are probably aware by now, Yahoo Site Explorer officially shut down on November 21st, 2011. To many, including myself, this is a sad moment in internet marketing history! I have relied on Yahoo to check how many links my competitors had and how many links my own sites had ever since I began building niche sites. So now we are all forced to do our link analysis somewhere else. But where is the best place to check backlinks? Today, I am going to review several other sources that are great Yahoo Site Explorer Alternatives. Some are better than others, so I will provide my own thoughts on where to gather link data. Yahoo Site Explorer essentially moved everything to Bing Webmaster Tools. 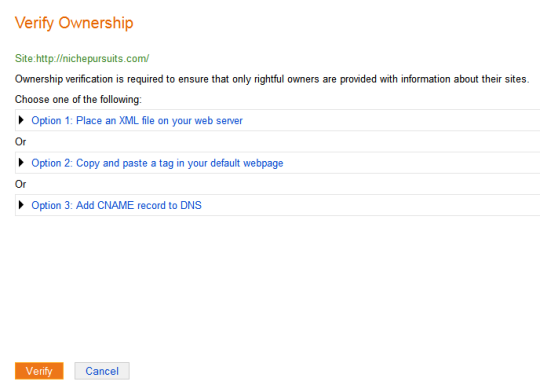 However, the only issue is that you can only get link data for the sites that you own now. In fact, I tried to get the link data for nichepursuits.com and found out that it can take up to 3 days to get any data because your sites have to be verified first! Bad move Bing. In my opinion Bing would get a lot more webmaster to sign up for their “tools” if they did not require this verification and opened it up for free to check ANY site just like Yahoo did. The data is supposed to be exactly the same as was showing on Yahoo Site Explorer, but the downside is that you can only check link data for sites that you own. Most people, and particularly niche site marketers, need to check the links for their competitors, so Bing Websmaters Tools will just not do. 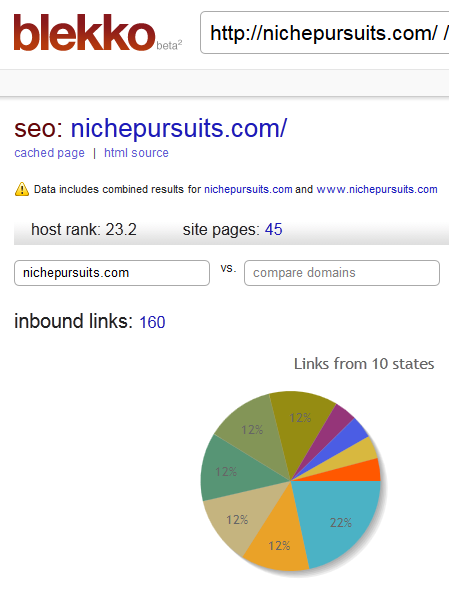 From memory, I recall that Yahoo Site Explorer showed that I had around 290 inbound links to NichePursuits.com. We'll use this number to compare with others – at least until my 3 day wait is over with Bing! Open Site Explorer is an excellent alternative to Yahoo Site Explorer, because its free and it provides link data for any URL you want to check…yippee! Open Site Explorer is a very robust system that not only provides you the number of links and anchor text, but also provides you with “Page Authority” and “Domain Authority”. These are values that SEOmoz assigns to pages/domains from 0 to 100 which specifies how strong they are. Getting links from sites with higher page authority will be more valuable. The only downside to Open Site Explorer is that its index rate (how quickly links show up) is a bit slower than Yahoo was. Yahoo would often index new links within a week or 2 max. Open Site Explorer updates their link index every 4 weeks. You can read about their schedule here. Their next schedule update in Nov. 30th. So, yes, its slightly slower but 4 weeks is actually not bad at all. In addition, according to their reports they are much better at removing links that should no longer be counted (such as when a link is removed). Yahoo often kept historical links in place even when it had been removed – which could give inaccurate data. In addition, Open Site Explorer does not pull in every single link out there as they are still growing their index. However, it pulls in the most influential links (those with the most page authority). So, overall Open Site Explorer provides lots of accurate data that is free. Majestic SEO gives some basic data for free, but has one of the largest index of links out there, and has some very in depth analysis tools if you are willing to pay for them. 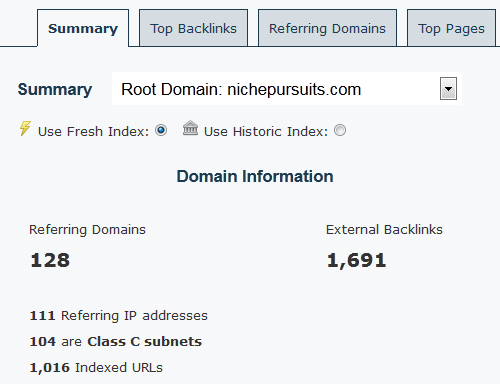 In fact, I was shocked to see how many links Majestic SEO is showing for NichePursuits.com – 1,691 if you use their “Fresh Index” and 2,921 if you use their “Historical Index”. Like I said, this is WAY more than Yahoo Site Explorer every showed. So, I tried to do some research to find why its showing so many links. I don't have a definitive answer other than Majestic SEO has one of the largest link indexes out there and so they show more links. Its unclear if lots of these links are coming from a few sites (for example a blog roll link could show up on 200 pages of 1 site). In addition, the key reason why Majestic SEO is showing more links than others from what I gather is that they just index everything, while other tools filter out duplicate content or other no-value type links. 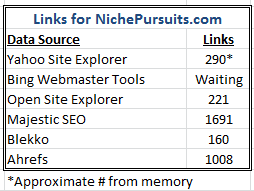 So, while Majestic SEO shows my site has 1,691 links in their fresh index, its possible that most of these (1,400 or more?) hold very little to no SEO value compared to the data provided in other tools. However, I'm sure if I joined their paid service I would be able to analyze deeper and quickly see the links that truly held value. Blekko.com is a newer search engine that is trying to keep lower quality content out completely. Its an entirely different blog post to analyze what they do and what they don't, but essentially they don't even index low quality sites. So, this causes their index to be smaller overall, but any links that they do show would be considered of higher value. Overall, Blekko.com is a service to keep your eye on. They are an up and comer that is still in beta, but is doing some interesting things. The link data they provide is free and while doesn't have as large an index still provides some valuable details. I have to be honest, I had never heard of this service until I started researching for this blog post. 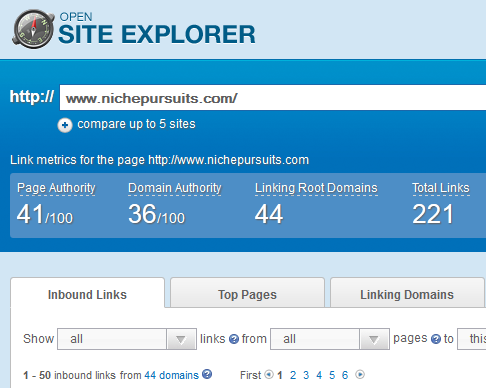 However, it looks like Ahrefs Site Explorer is a pretty decent service from my quick review. Its a free tool for your first 10 requests per day without having to sign up. So, Ahrefs shows 1008 external backlinks, but breaks it down to show that 277 of these are text links and 728 are image links. I have no idea why most of these links are image links – any ideas? 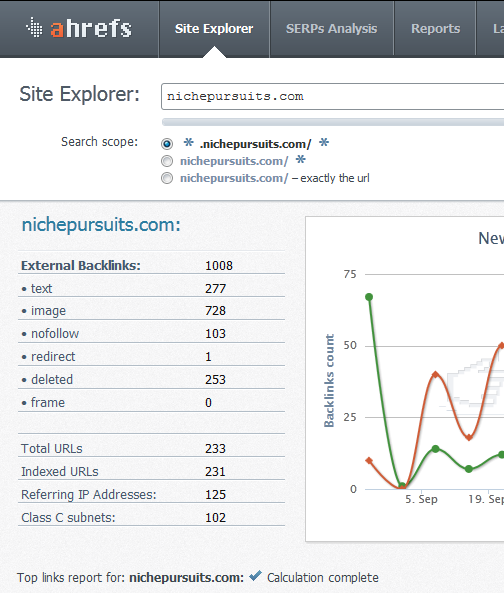 But you will see also in the image above it shows Total URLs linking to NichePursuits.com, which is 233. This brings thing much closer in line with other link counts from the other tools. After all, if you have multiple links coming from 1 site does Google really count every single one of those links as a potent link? Probably not. Best Source for Checking Links? Its clear from the data that Majestic SEO has the largest indexing rate – so they report the most links. But is this make it the best tool? In my opinion, more important than having a large indexing is being able to quickly interpret which links actually pass some value. In that regard, it appears that Open Site Explorer does a better job of only showing links that actually pass some sort of “link juice” to your sites. It also appears to be the closest tool compared to Yahoo Site Explorer (if my memory serves me correct). However, the reality is that Majestic SEO and Ahrefs probably also show all the “juice passing” links in their paid tools area as well. So, in reality there are a few great options. Overall, I think one thing is clear; it is difficult to compare apples to apples in terms of what tool is better, because they all show different data in their own unique way. So, it would be important to only compare links from the same source when analyzing the top 10 competitors in Google for example. It would not make any sense to look at Majestic SEO links for one site and then Open Site Explorer for a different site. For the most part these tools will still give you the ability to successfully analyze the data for competing sites. What About Long Tail Pro? Long Tail Pro was using Yahoo Site Explorer to get link data for competitor analysis; however, we officially made the switch over to Open Site Explorer. Users of Long Tail Pro now have the updated version which allows them to continue to look at the link data (now with Open Site Explorer) and several other important criteria when analyzing the top 10 competitors in Google. This is inline with what Aaron Wall at SEObook.com has done for his SEO for Firefox Tool as well. Aaron is very reputable in the SEO community and is using Open Site Explorer as his go to source for his very popular tool. Many other tools have done the same. Overall, moving away from Yahoo Site Explorer is something that is going to take me and everyone a little bit of time to get used to. However, the great news is that their are some excellent alternatives out there. And my guess is that there will continue to be more and perhaps even better alternatives that crop up in the future from some savvy entrepreneurs. Anyway, I would be interested in hearing your thoughts on these Yahoo Site Explorer alternatives! Did I miss a good alternative? What insights do you have to share on this subject? Is More Website Content the Answer to Increased SEO Traffic? Thanks for doing this post Spencer. Yahoo links has been buggy for the past couple of months so I made the switch over to open site explorer. I really recommend that your readers grab the free MozBar Chrome add on from SEOMoz. It’s sort of like an SEOquake tool bar that pulls its data from the Open Site Explorer index. Yep, Yahoo was definitely dying over the past couple of months. Thanks for the tip on the SEOmoz toolbar. Thanks Vic! I used Open Site Explorer before, but only have the free account. I may consider getting paid Majestic Seo account later. It would be a win-win situation for Bing as they could promote their AdCenter at the same time. I agree that it would be a smart move by Bing to open up the link data for anyone – definitely a great way to promote their adcenter as well. This was my big question and i started to do a research for that and i finish with the same conclusion , site explorer is the best and i trust them since their CEO (Rand Fishkin) is a SEO lover and also from my point of view this guy is willing to do some changes on SEO world. Yep, I agree – SEOmoz is in it for the long haul and I only expect their tools to get better and better. Great post as usual Spencer. Could image links simply be people linking directly to your images? You use a lot of great data in your posts so I could see how these would be reused often. Very interesting, let me know if you confirm anything. Going forward I think I will use Open Site Explorer. As you have found, it’s simply the closest thing to Yahoo Site Explorer out there. I’m glad you selected it for LTP. Thanks Joe! I suppose that the image links could be exactly as you suggest there. I had never even thought of that as a method of getting links. I also can’t imagine these types of links would be very powerful. I think text links would be much more useful. Yes, we did a lot of searching over the past few months as to the best source of link data, and Open Site Explorer came out on top for implementation in Long Tail Pro. Thank you Spencer. Your posts are very thorough and I appreciate them. You got me thinking when you said Open Site Explorer provides anchor text. One of my favorite things about MS is they provide anchor text and page rank for competitor links. How difficult would this be to add these features to Long Tail Pro? This would be a fairly involved process to add anchor text analysis to Long Tail Pro. Part of the strategy of Long Tail Pro as well is to keep things simple for users to do quick analysis on lots of keywords. Get the information you need and move on. This has worked very well for me and how I do my analysis as I look for very low competition keywords – I’ve never looked at anchor text information. I can see the value in the data for larger sites and bigger competition, but for the most part I think its overkill. So, yes, it could be added, but at this point I want to keep the software as focused on providing the necessary data quickly to end users. Good info Spencer. I think this offers Bing an opportunity to reposition themselves. It will be interesting to see where they go with it. As, always I appreciate the insights you provide. Yep, they definitely have an opportunity to shake things up. I still don’t think that this backlink data show a real competition. My blog has much higher page authority (based on open site explorer), more external links (open site explorer and yahoo explorer), with proper optimized keyword, and yet I still rank lower than other with lower pager authority and backlink. Now we only can see backlink counts and not the actual links/pages unless we pay $80-100 per month to someone? That’s quite a large chunk of change. Where is SEOSpygGass getting its data now? Spencer – thanks very much for the new info which was very thorough and useful. I know you and a good many othert marketers use Firefox. I downloaded it but I have much too much to do to stop and figure out how to use it so I’m sticking with IE8 for now. I went to Firefox a week or so ago and they said I had to download another version anyway as there was a problem with my version. I understand some plugins won’t work with Firefox depending on the WordPress theme one uses. Am I missing something by not using Firefox? Mary, I don’t know of a single WordPress plugin that won’t work with Firefox, unless you were using a very old version of Firefox. FF updates pretty regularly now and I think we’re on version 8 at the moment. The confusion may come because there are a lot of addons available for Firefox which are called “plugins” but have absolutely nothing to do with WordPress plugins. They are addon programs for firefox, just as wordpress plugins are addon programs for wordpress. The most commonly used Firefox plugins for marketers are the SEO ones: SEO for Firefox, Rank Checker, and SEOQuake. Whenever Firefox is updated, a new version of these plugins is usually released quickly and they update themselves without any manual intervention from you. Yeah. Thanks for the good list over here. The yahoo site explorer was a great tool to find out back links. The most important thing is that it is free of cost. There are many options available but paid ones. It is actually a bad thing in SEO point of view but this makes Google and other search engines to provide results even more better because most of the link spamming can be considerably reduced. However, in future links are going to be a important thing to decide the fate of products or content. Because links are recognition, identity, uniqueness and authority to a page. Open Site Explorer is bogus as far as judging the competition on a keyword. I hope I’m wrong but its returning such a tiny value that its statistically insignificant data. I addressed this in the article. Its not bogus, its just showing the more valuable links. I have been doing competition back-link analysis in 3 steps. But i want to emphasis that im fairly new to this process. 2) ahrefs to look at the relative order of anchor texts. 3) SEO SpyGlass to look in detail at the quality of the links. Its an amazing tool which gives you a ton of data. My thinking is that a page may have 10 backlinks but if they are all PR8 from relevant sites good luck. This is a slow process btw. I also look for Internet Marketing savvy. If I see more than one site that has all the flags that its someone like us targeting the keyword relatively competently I move on. At this stage im still looking for low hanging fruit. Question: Do you do keyword competition analysis for just the anchor keyword the domain and home page are going to be based on or also for the primary target keywords of the inner pages? So if you are planning on have 5 pages do you make sure they are all going to rank in the top 10 for their respective keywords? Bob, yes I just look at the primary keyword when doing analysis. Also, I also look for other niche sites in the top 10 (you call this “internet marketing savvy”). I actually view this as a low competition site if I see other exact match domains that are simple adsense sites. I know how easy it is to rank emd with very little content sometimes. So if I see other niche site competitors…I see that as a green light for me to get in the market actually. Interesting… My thinking was that I would end up in back link war with the other Internet Marketer which given your experience, you are probably a lot more confident about than I am. Also I dont have a feel yet for what the marginal cost per additional juice back-link is to page and at what point it becomes to expensive or pushes a given websites profitability to far out into the future. Im probably over thinking it. Well, I see it as there are 10 spots on the first page of Google, if one other niche site marketer is there – that just lets me know I can probably get there 2. We can both make money from it. Thanks Spencer for this great article, i was watching as well for an alternative of yahoo. The seo bar of firefox (seo book) are using since yesterday blekko. I will try open site explorer as well to see. Freddy – the seo for firefox is showing both blekko and open site explorer actually (OSE). Thanks so much for this information. I started a new niche site and used your free guide as the basis for my research. I am trying to keep up with the backlinks so this really is helpful. Does this change how you look for keywords using Long Tail Pro? I watched your video and was wondering if the switch to SEOMoz Page Links changes the criteria you use for targeting keywords. Long Tail Pro is a great tool, by the way. Sure, it changes things a bit. However, overall the principles are the same. You want to look for results with low link counts. The change is determining if less than 10 links is a low competition keyword or if there is a specific number to look for…. I am anticipating your post on how to do the top 10 analysis based on the yahoo site explorer alternative. But it is not working on me. Whenever I try to do the same I am getting a error site not able to validate. Yes the death of yahoo site explorer made a lot of similar sites to emerge, Spencer i have wrote about some FREE and handy Yahoo site explorer alternatives hope you will find it good. I am verry disapointed that yahoo shout down site explorer. It was my number one tool. Thanks for the review of the other alternative. Never heard about Open Site Explorer before. Thanks for the heads up on it! Went to check it out and after a couple domain searches, I was redirected to the PRO trial offer. Every time I hit the back button and tried a new search, it continued to give me that redirect. So, is Open Site Explorer really free then or does it limit your searches per day (unless you sign up for the PRO version)? Nevermind – actually answered my own question after signing up for a free account. Now everything is good. Thanks again though for mentioned Open Site Explorer. I definitely think it’s somewhat comparable to YSE and should serve as a good tool for measuring backlinks down the road. Bryan, glad you found it. Yes, you have to sign up for a free account at least to see some basic data over 10 requests per day. It would be interesting to compare the links that Google Webmaster tools shows. Even though you can only look up links for domains you control, like Bing is currently, it may be useful to gauge the similarity to what Google shows. thanks,spencer,very useful review article,but most of them are paid tools if wanna go deeper. Jojo – yes that’s very true. Unfortunately, Yahoo Site Explorer was one of the only totally free tools out there. Because of this post, is the reason why I bought Long Tail Pro… The program works great! 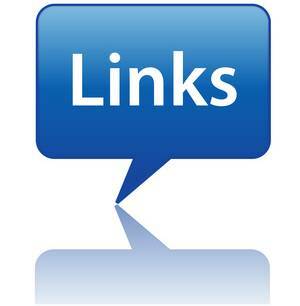 By the way do I look at “SEOmoz page links” for the correct backlinks? You know what’s weird… I was checking backlinks for a site that definitely has links from multiple indexed articles on ezinearticles and none of those links showed up in Open Site Explorer. I checked ahrefs also for the hell of it and they didn’t show up there either. Bud – It can take a few weeks for these links to show up in tools. Have you heard about our Link Research Tools? and is aimed at highly professional users. which is a super-fast replacement for Yahoo Site Explorer at a very affordable price point. to get the free account. This coupon is limited to 5 accounts for now, signup soon – Dec 31 latest. And please let me know if you need more. No credit card or Paypal account is needed to perform this. QBL (Quick Back Links) tool for a whole month. Just make sure you sign up before Dec 31. Also if you would like to do a full review, just let me know. Christopher – Thanks for sharing, I have never heard of this so I’ll check it out. You’ve done a stellar job of reviewing some excellent alternatives and I quite like the idea of comparing the number of backlinks across all services to see how they fare. As you say, there’s quantity, and then there is quality. The transition over to Bing has been a little rough for some webmasters, but hopefully in the end it will be for the better. We have created a website dedicated to helping people find suitable alternatives to Yahoo Site Explorer. We’ve reviewed over 10 alternatives so far and are collecting more and more sites to review and report on. I plan to create a features matrix with a Top 10 tools list so that other features can be compared in a simple chart as well. We thought folks might be interested in seeing what might still be available for use at siteexplorer.co. We did a short blurb on Link Research Tools and a few others. I’ve been trying to find where I can check backlinks for long time. Now I’ve got it. Thanks for your sharing. ..I’m just wandering the blogosphere and here I am at your blog. Great post. Yahoo site explorer rocked, and now we are all making due with what we can find. I use RankTracker, which is pretty good, but I bought the suite and it was 800.00 dollars. These are great tools for people searching just a few of their own personal domains. Thank you for all the information, keep on posting and more power to you. I recently completed a review of all of the best backlink checkers and published the results of how they perform against each other. This one is totally free and no limit, this means you can know all the backlinks quickly without costing one coin. Yeah, the old Yahoo Site Explorer is something I still miss. Most of the new options are either absurdly expensive for the average blogger, provide only a few limited searches, and are still poorly updated. The only yahoo tool was amazing, such a shame it’s gone. Good article and I love LongTailPro. I’ve recently stated a blog on how to earn passive income online. I have been personally building quality backlinks and the differences in the backlink checkers is almost pointless for a new site. Guess just continue to build quality links and the rest will work it self out. hi there,!nice to meet you.